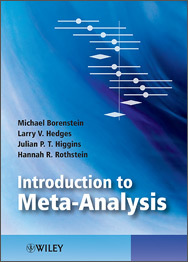 Dr. Michael Borenstein, one of the authors of Introduction to Meta-Analysis, is widely recognized for his ability to make statistical concepts accessible to researchers as well as to statisticians. He has lectured widely on meta-analysis, including at the NIH, CDC, and FDA. This workshop is intended for researchers, clinicians, educators, statisticians, graduate students, and anyone with an interest in understanding or performing meta-analyses. Our approach is primarily conceptual rather than mathematical, and participants with only one or two statistics classes in their background should be able to fully understand the materials. Comprehensive Meta-Analysis (CMA) is one of those rare tools in the research arsenal that does what it is purports to and makes both the process and output understandable. I have used CMA for seven years in my own meta-analytic work and in EBP workshops and courses. The ease of learning the program application and the resulting output make for a wonderful data analysis and learning tool. The workshop is based on the best-selling book Introduction to Meta-Analysis (Wiley, 2009). Learn to understand a meta-analysis, to perform a meta-analysis, and to avoid common mistakes in meta-analysis. The lectures will focus primarily on concepts and practical applications rather than formulas. You will learn to understand a published meta-analysis. You will also learn how to perform simple meta-analyses and more advanced analyses using the software Comprehensive Meta-Analysis. The workshop on meta-analysis you presented at CDC was incredibly helpful. It provided us with basic and also up-to-date knowledge and skills to critique and perform meta-analyses. A very clear, usable way to approach meta-analysis. As a non-statistician, I found this course very understandable and applicable to my work in systematic reviews. Dr. Borenstein has a gift of being able to clearly explain difficult concepts. This is a fantastic course!